We're not averse to rocking out occasionally here at Punks On Postcards. On no indeed. 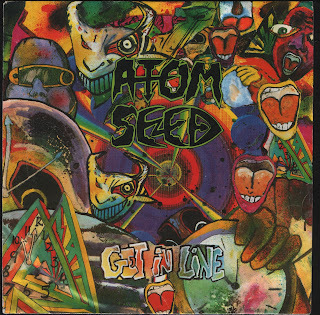 From the 1991 single (which was off the 1990 L.P.) I give you The Atom Seed with 'Get In Line'. First heard these on Peel when he played the first 12 inch a few times. Bit of a Killing Joke influence in there with the old guitar work. Still sounds good to me this. Let's Rock! THANKS FOR SHARING THIS SINGLE AND AFTER SO MANY YEARS THE LINK IS STILL WORKING.HARD TO FIND STUFF FROM THIS EXCELLENT BAND.ANYONE KNOWS WHERE TO FIND THE WHOLE ALBUM?GREETINGS FROM TEZIUTLÁN,PUEBLA,MÉXICO.